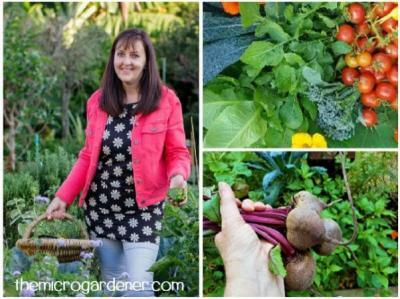 How to Garden on your Benchtop – Grow Sprouts! Sprouts are seeds that have been germinated in water. They form a tiny root and a shoot. These baby plants are a nutritious food you can grow all year around. No soil needed! Dig in to learn how to sprout your own seeds. From Seed to Feed – Why Grow Sprouts? Highly nutritious and tasty living food. As a seed, they provide Vitamins A and B, but when sprouted provide Vitamin C! Wide variety of flavours to choose from. No fat, low in kilojoules but high in energy. Take up minimal space in the kitchen. 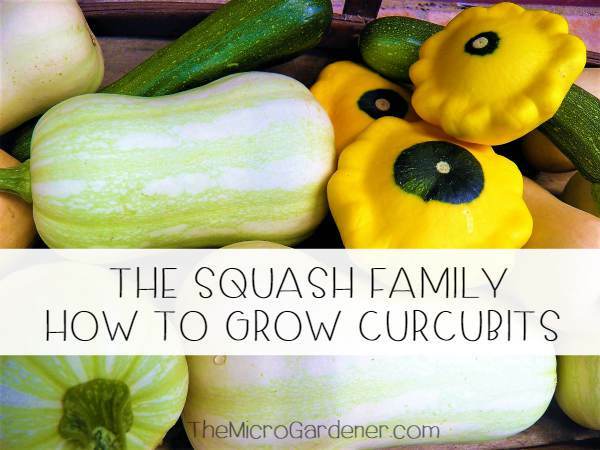 Don’t need a garden to grow them – can be grown indoors. Seeds transform from an acid to an alkaline food when germinated. 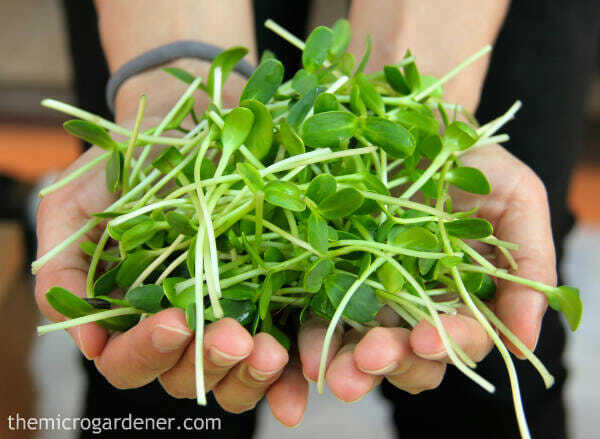 Like microgreens, they are full of living enzymes that aid digestion and perform other important functions. Good value – can multiply up to 15 times their own weight. Seeds store well so they are a good emergency food. Have no waste in preparation. Organic food – no pesticides, herbicides or fungicides. Helps reduce food miles by growing your own food. I strongly recommend you ONLY buy certified organic seeds or seeds that are sold as safe for sprouting. Why? Commercial seeds sold online, at your garden centre, nursery or other retailers may not be safe to consume for sprouting. Fungicides are often sprayed on non-organic seeds to prevent rodents eating them during storage. Organic sprouting seeds have been grown and cleaned so they will be free of pathogens. Conventionally grown (non-organic) seeds sold for sprouting may have been soaked in a toxic bleach solution that kills the good bacteria. Bleach is a dioxin that won’t break down in nature and is a known carcinogen. 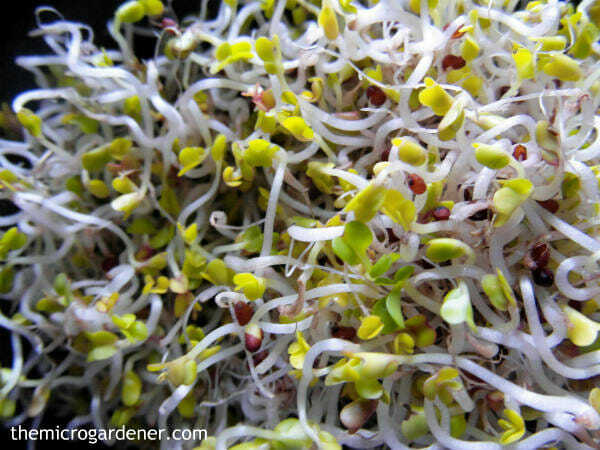 What Should you Look for when Choosing Sprouting Seeds? 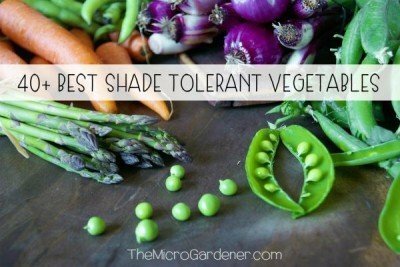 They may be labelled as ‘Sprouting’ or ‘Microgreens‘ seeds. Make sure they are raw not toasted or roasted seeds – these won’t germinate. 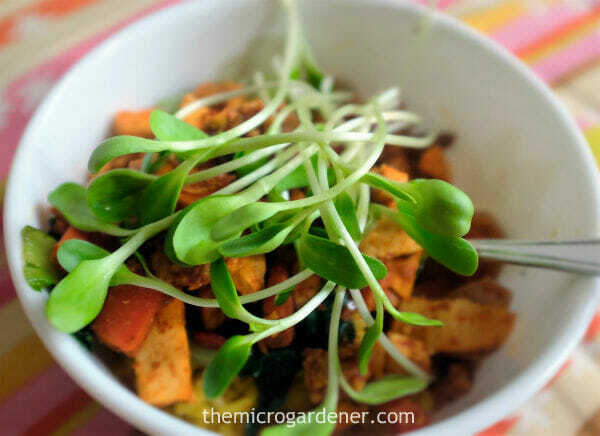 Sprouting and microgreens seeds have a much higher germination rate than regular seeds. 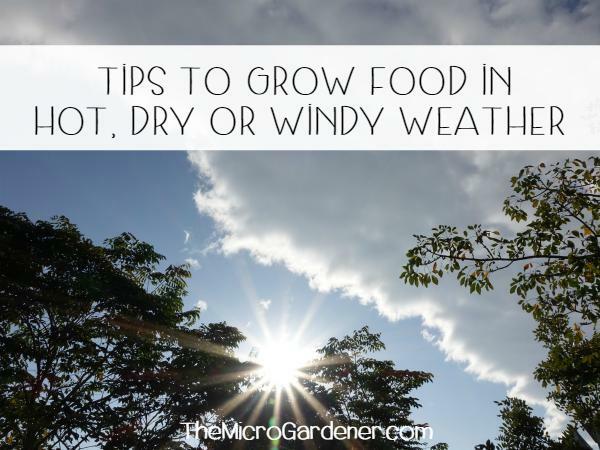 To sprout you need four basic things: Seeds, moisture (water), warmth (indirect sunlight) and time. You can make your own jar to sprout seeds in too. This method does take a bit more work, because you really have to pay attention to correct drainage. If you don’t drain your seeds properly, you can end up wasting money and time if water remains in the jar and they rot. If you’re an experienced sprouter, you probably have the confidence to use one of these jars. or even easier, one of the ready made sprouting tops for jars. Once you gain confidence growing easy to sprout seeds, you can try different varieties and flavours. 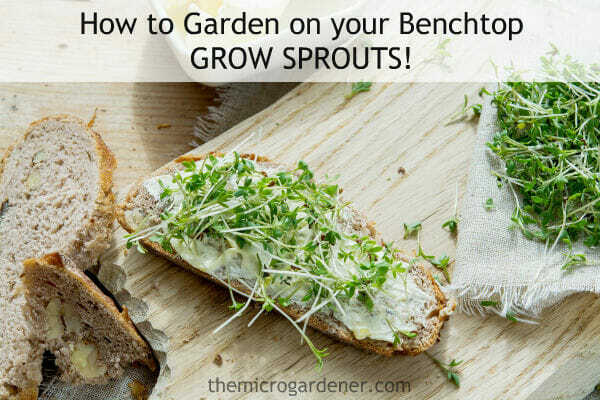 The best thing about sprouts is they can be grown on the kitchen bench. They are close to the sink for rinsing and the windows provide sufficient light to help produce green leafy sprouts. Alfalfa sprouts have a delicious delicate nutty flavour. They are rich in vitamins and minerals; high in protein and fibre; and only take 3-5 days to harvest. 1 tablespoon of seeds are pre-soaked for between 3 and 6 hours. Then rinsed 2-3 times/day and yield 1½-2 cups of nutritious tasty sprouts! What great value. Alfalfa sprouts are one of the most economical, high nutritional value foods to eat. They can be enjoyed in salads, sandwiches and juiced. Wash seeds well in water before you start soaking but follow the directions to timing. 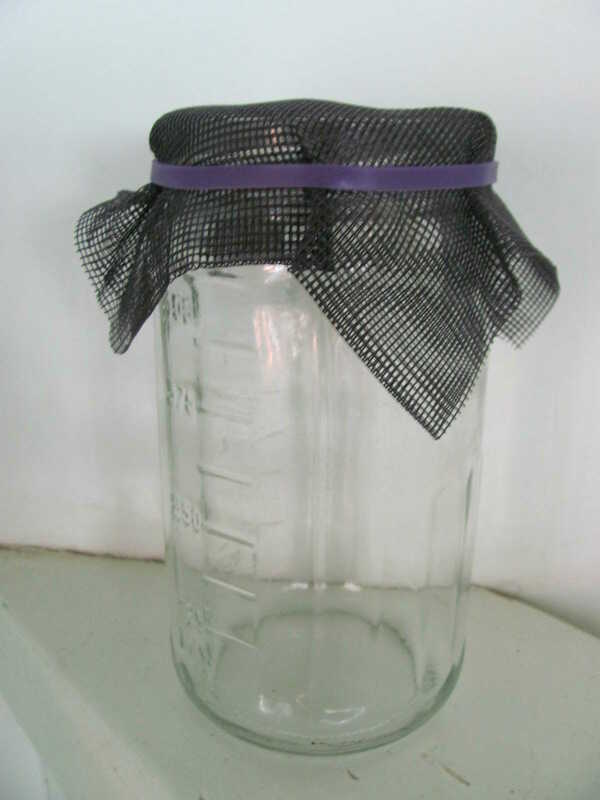 Use clean seed and a sterile sprouting jar. All seeds germinate within a specific temperature range. Most seeds germinate between 20°C – 25°C. Check your seed packet for directions. When sprouting in cold weather, you can try using a heated propagation mat. 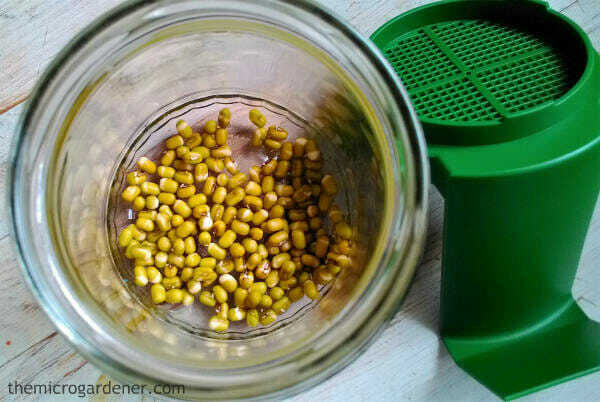 Wash your sprouter really well between growing each crop of sprouts. Pre-soak the seeds for the required time. Then up-end the jar and stand it at a 45 degree angle by leaning it on a dish drainer. This helps the soaking water drain out properly. Draining helps prevent bacteria from growing. Skim off any seeds that float. They are usually not viable. All seeds need air to germinate, so good aeration is important. 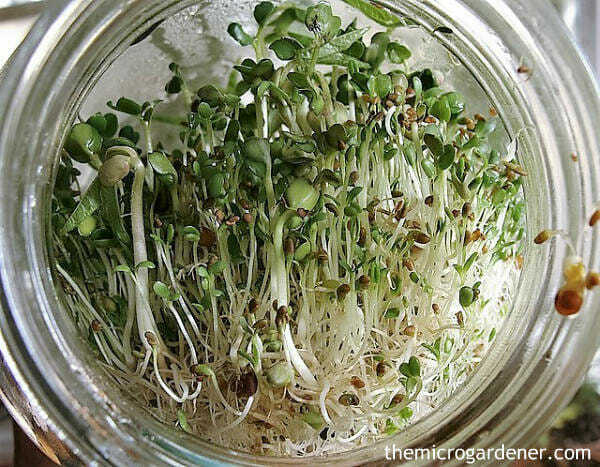 Avoid putting too many seeds in the sprouting jar. Oxygen needs to be able to circulate freely. Rinse well at least twice a day and drain extremely well. Seeds can rot if there is poor drainage. Thorough and regular rinsing with pure water and good water pressure is vital. If you will be out when the sprouts need rinsing (especially during hot weather), leave them in the fridge until you return. Rinse in cold water. This keeps the seeds moist, cool and alive as well as removing waste material. In hot weather, rinse more frequently but always be gentle. If you are using a jar, after rinsing, roll it around in your hands to loosen the seeds inside so they don’t stick together in one clump. When sprouts are ready, make sure they are very well drained. They should feel dry to touch before storing them in the fridge in a container that breathes rather than a plastic bag. Seeds smell ‘off’ or become slimy – This can be caused by putting too many seeds in your sprouter. Because seeds need air, some may suffocate if you overcrowd the jar or tray’s capacity. Some seeds don’t germinate – Can be caused by overcrowding or insufficient soaking time. If you don’t rinse enough, the seeds can dry out. Lack of germination can also occur if you try to sprout during very high or low temperatures. To maximise nutrients, expose the sprouts to full sunlight on the 5th day. Seeds are ready to eat when they have grown their first pair of seed leaves. You can also wait until they have grown their first pair of true leaves to eat them. They are known as microgreens at this stage. Beyond this they may become bitter and too fibrous to eat. So now you have the basics you need to get sprouting! 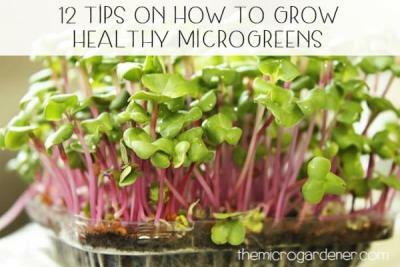 You may also enjoy growing microgreens. See Easy Guide to Growing Microgreens and 12 Valuable Tips for How to Grow Healthy Microgreens. 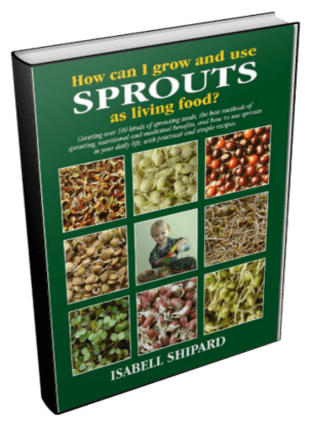 For more in depth information, refer to Isabell Shipard’s fantastic books ‘How Can I Grow and Use Sprouts as Living Food?’ and ‘How Can I Use Herbs in My Daily Life?‘ These are two of my favourite books and I thoroughly recommend them. Read more about open-pollinated seeds and getting a small kitchen garden started. Please share! Join my free Newsletter for more exclusive insights, tips and all future articles. What kind of base do micro greens sellers use at markets. They look like hard flat shells? Best to ask them directly as I’m not sure what you’re referring to. There are lots of options! Do you know how I can order the sprouting jar with green lid and 45-degree rest built-in to the green lid? I live in New York City? The specific sprouting jar I use with the handle is from a supplier in Australia. however below is a similar one available via Amazon that you could look at that may meet your needs. You can tilt your jar in a dish drainer at the same 45 degree angle with similar results! Very easy. Hope this helps.